CASHEW. May contain traces of NUTS. 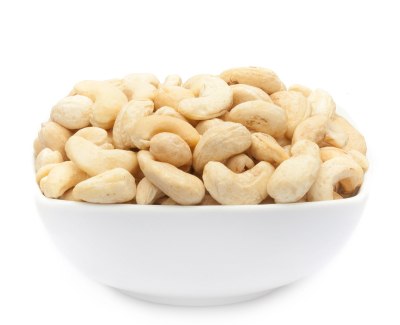 With moderation enjoyed, are the fine CASHEW PURE an ideal partner when it comes to healthy eating. For snacking between meals or after your workout cashews are ideally suited. They are characterized by their rich protein content and the high incidence of unsaturated and polyunsaturated fatty acids. Moreover, they naturally contain tryptophan, which the body converts into endorphin. For the good record of trace elements and nutrients, the high incidence of magnesium, iron, zinc, potassium, phosphorus is provided. The essential vitamins B1, 2, 5, 6 & 9 complete the profile of CASHEW PURE making them really impressive. All in all, this popular nut kernel with its Brazilian roots across the globe. Not only because of its ingenious mineral balance but because of its fine buttery-nutty flavour, which works without any spices or flavour enhancers. The vegan cuisine has the ingenious neutral flavour of CASHEW PURE long recognized. The very own consistency of the cores makes it a culinary all-rounder, which can be used not only as a snack but also for savory and sweet food while impresses with its wonderfully buttery-nutty flavour and gives the courts his distinctive sweetish nutty flavour. Here Otto-Normal consumers often do not know under what circumstances the fine cores are traditionally harvested and what effort are hidden behind them. In Thailand, the noble nut grows protected from the pulp. To get to the fine core, the first shell of the cashew must be removed, however, that contains an extremely aggressive juice. To reduce the corrosive effect of the oil in the shell, the cashew is first dried and then boiled. After that, only the brown skin must still be removed. The reward for their efforts is the buttery-smooth core, which is so incredibly popular and flavoured. A pure slice of nature - without any additions you can enjoy our gorgeous CASHEW PURE. As a snack food, or used as an ingredient. In the vegan kitchen, these delicious small core ensures just smiling faces. Mixed, mashed and then as a worthy alternative to mozzarella, fresh cheese or grated cheese succeeds playing to draw our CASHEW PURE all attention to his creamy aroma. And all this without animal products. Thoroughly enjoyed nutty and sweet, pure, he is a unique friend for all who love the particularly pure and thereby want to put their food culture with a valuable sign. For himself and for nature. By the way, this little guy tastes simply outrageous good. A snack that quickly needs to get on your kitchen shelf a special place.